“He became so weak that he almost collapsed in my arms. He had been throwing up for a while and had lost all his energy because of it. For a while I even thought that we had lost him – that’s how pale and lifeless he looked. "-Poonam, mother. 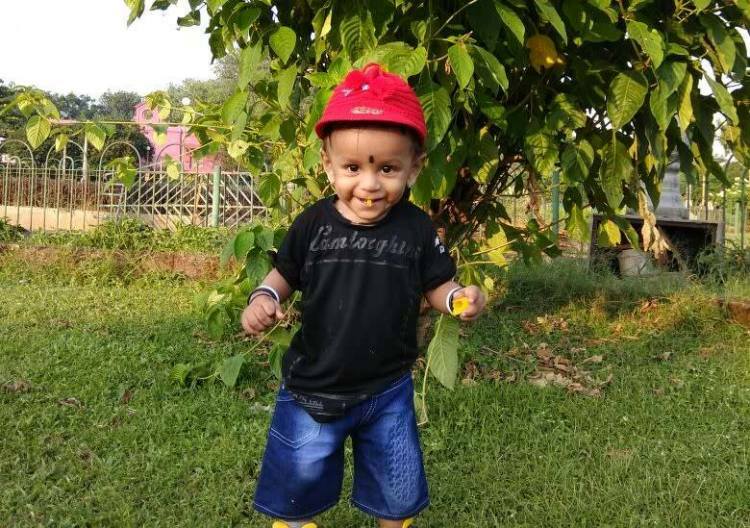 Baby Smit and family had just been back from a trip to Mahabaleshwar for which his father had been saving up for days. 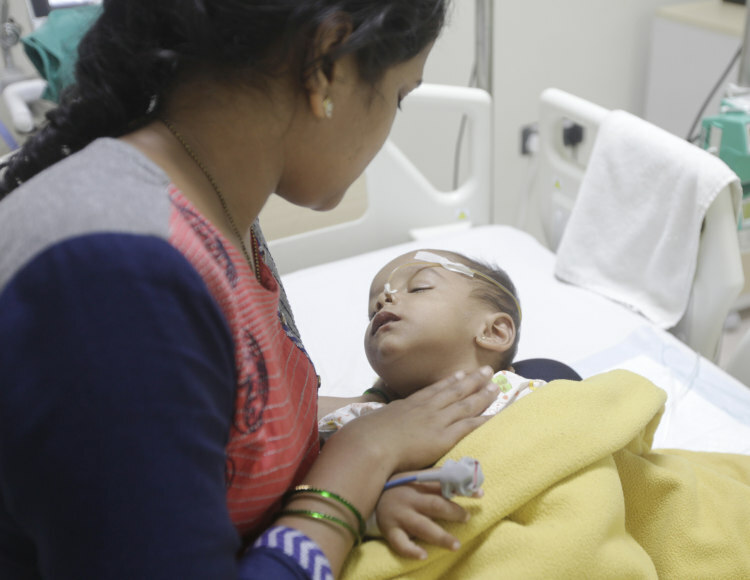 Soon after they reached home, he developed a high-grade fever that refused to subside despite his mother, Poonam’s efforts. 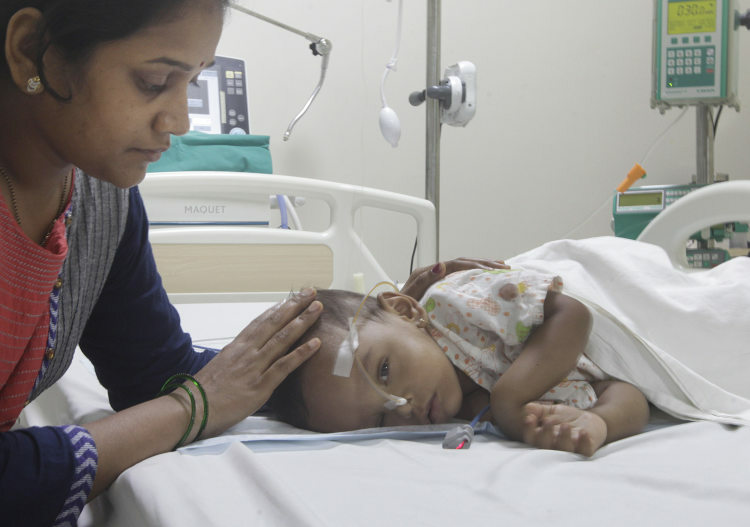 When it was followed by loose motion and vomiting, Poonam’s maternal instinct told her that something was very wrong with her child. Govind and Poonam had never faced a situation like this in their lives before. Their seemingly healthy child had become so ill all of a sudden and they blamed their trip for it. They just hoped that doctors would tell them that it is nothing to be worried about, but the opposite happened. After a round of blood tests and scans, it was found that Baby Smit’s liver had failed. “We were expecting the doctor to tell us that he had a bad case of food poisoning. Never in our wildest dreams could we have imagined that his liver would be affected. 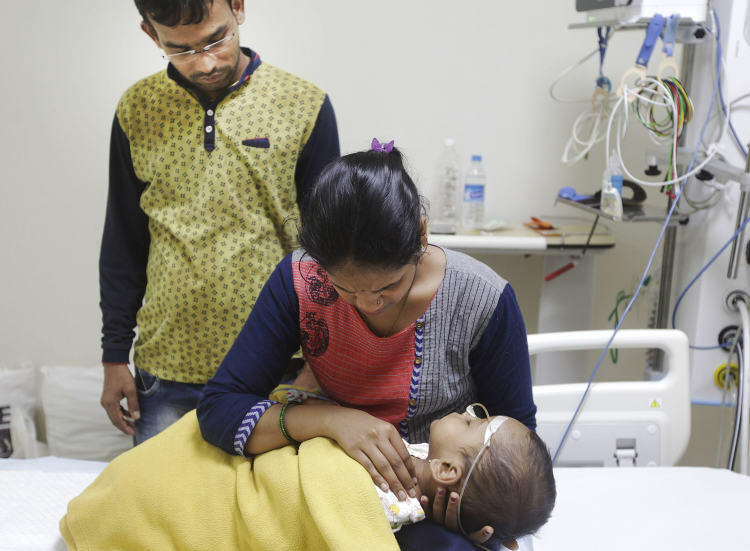 We kept blaming our trip for it – we had never been more excited about anything else before and now, our child has become so sick.”-Govind. When Govind sees his son struggling to live in the ICU, good memories come back to him. Despite being poor, he had always managed to provide well for Baby Smit. There was no toy that he did not get for his child. He made sure that he was fed nutritious food, however tight his financial condition was. 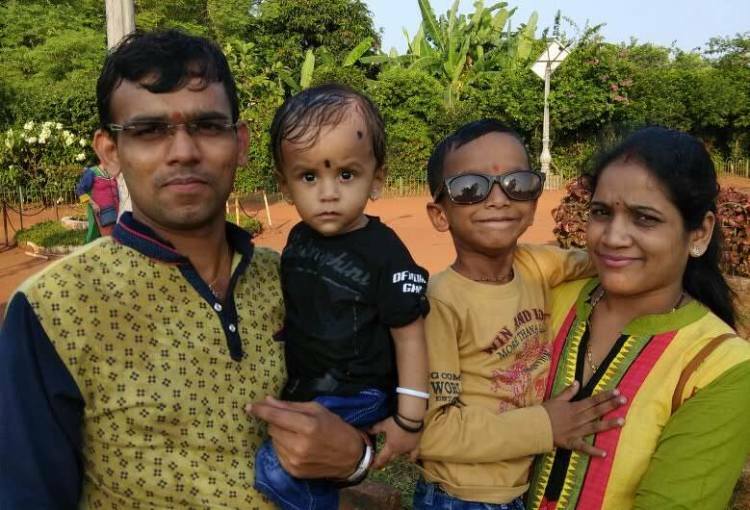 “He was doing so well – his mother and I would starve but never let the children (Smit and his 6-year-old elder brother Rudra) go to bed on empty stomachs. Just days before, he had spoken his very first words. He said ‘Dada’ so clearly that we were so proud of him. Now he is in the ICU, just hanging by a thread to life. I am running out of funds to save him.”-Govind. 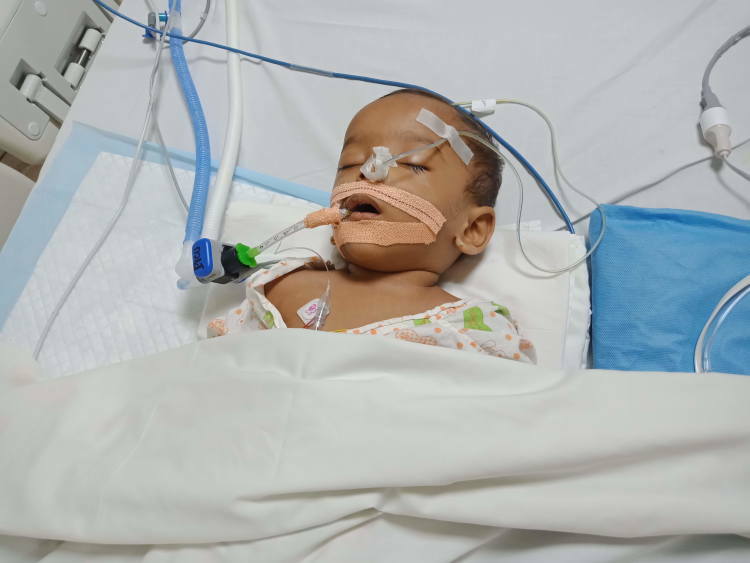 Smit’s liver had literally stopped functioning – he was unresponsive and unconscious when he was brought to the hospital. He even had significant kidney damage along with this. 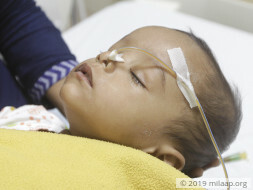 His liver was so swollen and infected that at one point, doctors believed that he needed a liver transplant. Medicines helped in improving his condition, but he is not fully out of danger. “My son is still critical. Anything can happen to him at any time. Seeing him fully covered in tubes is incredibly difficult for me. As a mother, you can never imagine such horrors happening to your child. We took care of him so well – I don’t know why his condition deteriorated. I feel guilty – I feel that maybe we may have missed any sign of illness.”-Poonam. “I keep waiting outside the ICU. I have to run around for medicines and other emergencies, so I have taken leave from work. My house runs on my meagre income. There is nobody else who can help us out so my wife and I have not left the hospital so far. Smit’s condition is unpredictable – anything can happen at any time. So we are just praying and waiting for positive news.”-Govind. Govind works as a peon in a private company. He earns very less, so he is not in a position to afford Smit’s prolonged medical management – without which the baby will not survive. Doctors have assured the family that Smit has a high chance of survival – but money is a big hurdle. He borrowed from family and friends and has somehow paid almost Rs 2 lakhs. But that is not enough to save this sweet child. Thank you for the support. 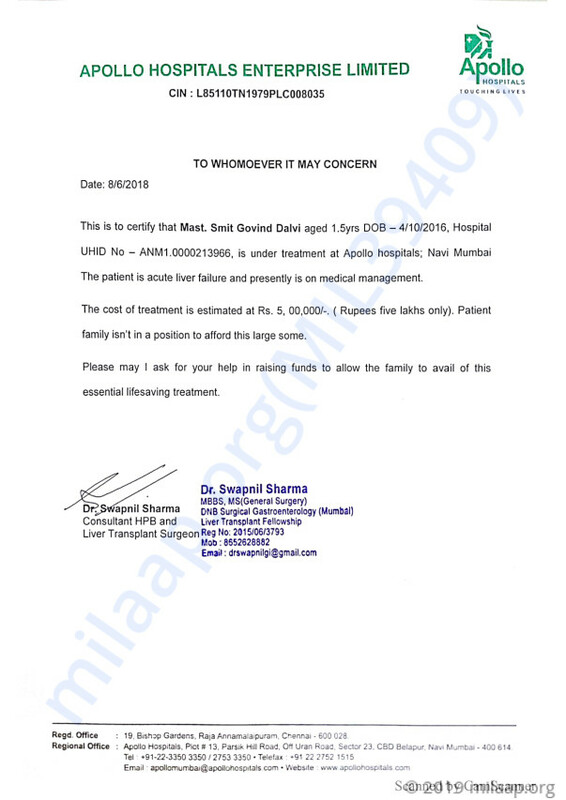 Here is a quick update on Smit Dalvi's health. He is doing better now compared to earlier and his fever has also reduced. His health slowly improved and his vitals were also showing signs of recovery. Based on his health, the doctors have given him a discharge from the hospital. however, they have suggested regular follow-ups to monitor his health until it stabilises completely. I would like to thank all of you for the wonderful support that you have shown towards his treatment. It means a lot to all of us. Please do pray for his health and speedy recovery. May God bless the child.